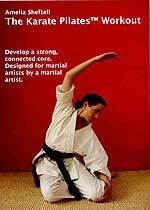 This innovative DVD brings the world of Pilates to karate and other martial arts. Pilates helps the practitioner learn to use the correct muscles, open the joints, and train the body for proper alignment and length. This DVD shows martial artists how to improve their training experience, muscle tone and stretch their limbs while at the same time reducing the risk of injury to the joints and muscles. This Karate Pilates workout targets the body core, or lower abdominals, so karate kicks and stances will become more efficient and comfortable. Pain and strains of the back and shoulders will begin to disappear as you develop stronger abdominals to take some of the load off muscles that martial artists typically overuse.